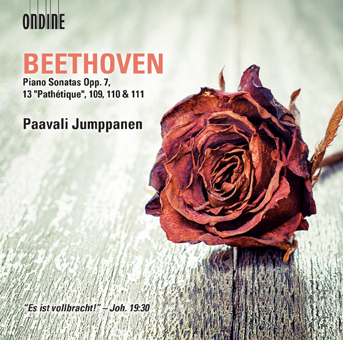 The final volume of pianist Paavali Jumppanen’s acclaimed cycle of Beethoven piano sonatas. This volume combines the early Op. 7 and the famous Pathétique sonata together with the Last Sonatas Opp. 109-111 written by Beethoven in the 1820s. Jumppanen has collaborated with numerous contemporary composers and premiering many solo and chamber works for the piano. He has worked personally with esteemed composers including Pierre Boulez, William Duckworth, Henri Dutilleux, as well as composers of his native Finland. On the DG recording project of the complete works by Pierre Boulez, Jumppanen recorded the piano sonatas upon the composer’s request. Paavali Jumppanen is an internationally esteemed pianist, a versatile performer equally at home as a concerto soloist, chamber musician, and a recitalist. His vast repertoire spans piano literature from Bach to the Avant-garde. Jumppanen has spent several years performing the works of Viennese Classics, in particular Beethoven. His performances of the complete cycles of Beethoven's and Mozart's Piano Sonatas as well as Beethoven's concertos and chamber music have won critical acclaim. Jumppanen’s instalments in the Beethoven cycle have received thrilling reviews and, among others, the ‘Choc’ Award from the French music magazine Classica.